Ascending Butterfly: During #Blogher15 @Staples took us all #BacktoSchool #StaplesBTS - Are YOU ready? 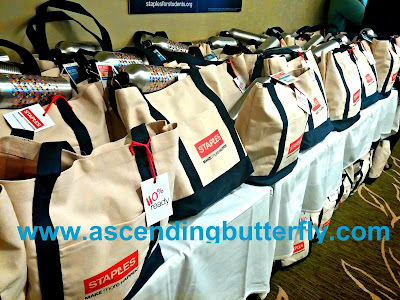 During #Blogher15 @Staples took us all #BacktoSchool #StaplesBTS - Are YOU ready? 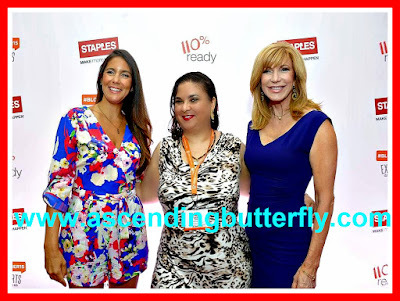 Blogging Conferences come with their share of private events (and in some cases have VIP badges that offer a very difference experience than the standard conference badge) and this year during BlogHer15, Staples organized an invite only Breakfast to help Bloggers get ready for Back-to-School with special appearances by TV Personality Leeza Gibbons and Jamie Primak Sullivan of #cawfeetawk and Bravo TV's Jersey Belle. Designed by Students - Who knows what students need better than students right? (Well maybe Teachers! ), but this line of products and tools designed by students to help address common classroom needs include The Big Pen (a pencil case and writing instrument all-in-one), the Big Props Pencil Case (doubles as a tablet stand) and the Super Folder which includes storage areas, a zipper pouch, clear pockets for class schedules, a pencil sharpener, sticky notes and a writing pad! Want to know HOW your purchase makes a SPECIFIC Impact? Camouflage - an 'army' of backpacks and accessories (no pun intended)! The OGIO Evader and Stellar Backpacks feature a large main compartment, padded laptop sleeve and ergonomic shoulder straps for comfort and there are coordinating Camouflage Composition Books and a Maze Calculator to match. Tech Pop Design - Exclusive Teen Vogue products which are only available at Staples (we have featured the collection before HERE), look for Teen Vogue BETTER Binders, Staplers, Patterned Folders and Staples Tech Pop Folders in stores. Graphic Design - Look for Continental Into the Wild and Continental Vibrance Notebooks and Composition Books and Tie-dye, inspirational sayings and fun graphics (including glasses and mustaches) from Gartner Studios. Fun for School - with favorite characters including The Avengers, Nickelodeon Teenage Mutant Ninja Turtles, Disney Frozen and more! Technology - From Scientific Calculators to Tablets including my particular fave the Microsoft Surface Pro, you can find the tech that your student needs at Staples as well! Tech Accessories - Staples Flat Charge & Sync USB Cables, for a 'cool factor' the Light Pulse Electroluminescent Charge and Sync Cable or even iPhone Cases, there are tech accessories to suit a wide variety of tastes. Above: Left: Jaime Primak Sullivan of #cawfeetawk and Bravo TV's Jersey Belle, Center: ME!, Right: TV Personality Leeza Gibbons! With Staples 110% Price Match Guarantee (through 9/15) and Super Wide Selection you can definitely consider them 'your one-stop shop' for Back-to-School this year! I have always admired Leeza Gibbons and it was neat to finally meet her in person! She is super down to earth. The photo above is the pro-shot that was taken, someone accidentally cut off their heads in the personal photo I had someone take with my camera and they were nice enough to take another photo. I didn't notice until I got home and saw the second photo on screen that my eyes were completely closed so I opted to use the pro shot instead for this post! and what is a Blogging Conference Event without an awesome gift bag right? Can't get mad at this big bag of 'swaggu'! Have you done all your Back-To-School Shopping yet? Even if you don't have to shop for BTS (I get ya, I don't have children either! ), many of the items above are just as perfect for a Home Office, which item referenced appeals to you MOST? FTC Disclosure: This is a NON -compensated post in conjunction with Staples, this is an event recap (a gift bag was received) and all my opinions are 100% MY OWN. I am disclosing this in accordance with the Federal Trade Commission 16 CFR, Part 255 - Guides Concerning the use of endorsements and testimonials in advertising, you may check our Giveaway and Disclosure Page for additional information regarding Ascending Butterfly Disclosure. Awesome blogger event! And just in time for the back to school mayhem. It great to know you had a great time! I was at Stapes yesterday to pick up my boys supplies for school. I go there every year because their prices can't be beat. What an exciting event! I am a BIG fan of Staples as there is always so many quality products at economy prices! I work from home, and my desk looks like a bomb went off on it. The organizational supplies would definitely be best for me. Same here! I call it my disorganized mess. I know right where everything is, but it sure doesn't look pretty. I laugh though because I used to be super OCD about everything having a place. I love when companies do more for the community. What a fun event! What a fabulous event. Staples is one of the best places to shop for school supplies. Their prices are unbeatable. I love their 110% guarantee. Its a great way to get people in the store. We already are back in school so we have everything, I wonder how much we would have saved if we went to Staples! I love that Staples is getting kids involved in the design process. I love the special line of items that you can get like teen vogue, nickelodeon, teenage mutant ninja turtles. I also like their price match policy too. I hope you enjoyed your goodie bag from Staples. I adore Staples, and think that a line by Students is absolutely genius! What better way to get what these kids really want and need than by having them design it themselves. And you cannot beat the Staples & Me to We campaign. Love when you see corporate social responsibility! I think that I am thankfully done with back to school shopping. At least I REALLY hope so. Considering I'm about $220 into school supplies for three kids. @_@;; I didn't look into things at Staples, though I should have. Since it's seriously maybe three streets away from me! I love the Staples Me to We program. I love when businesses give back. This looks like it was a great event! Staples is a great store. Whoa, I had no idea about the "Me To We" program. Sounds like a solid investment, and I'm so glad businesses have joined into it as well. For me Staples is a one stop shop for all of your back to school needs. Whether its computers, pens or furniture, they have it all! I enjoy shopping at Staples I always find everything me and the kiddos need :plus shoping at a store the gives back is beyond excellent. A line by Students is absolutely genius! So run don't walk !! Love Staples! Did all Andre's BTS shopping there. I love Me to We organization so I'm excited of the partnership! What an awesome conference. I love Staples and do all my back to school shopping there!! This is such a great program. I always enjoy supporting businesses that do things like this. That does look like a great event. Staples has good stuff. Wow... looks like a great event. I like Staples for school supply shopping. Yes, we have done our back to school shopping. We do love to check out Staples for great deals! Staples really does have so many great back to school options. Though we've picked up the usual supplies, I know there will be late night runs to Staples for poster boards, ink, etc. It sounds like you had a great time at the event. I need to head to Staples to get my office (corner of great room) organized. Sounds like the BlogHer Conference was fun. I wanted to go, but I was out of the country. Maybe next year. I have never shopped at Staples yet. We don't have one in our neck of the woods. Blog conferences sounds exciting. I'll tell you, as a work at home mom, I've gotten to where I love Staples. I can get supplies for myself AND for my kids in one stop! That's an awesome gift bag indeed! We're done with our back-to-school shopping and we've actually shopped some of the supplies at Staples. I still got a long way to go before I do proper school shopping for my daughter but it is always great getting tips in advance. I am finally done all my back to school shopping. This year was a bit different getting two kids ready for college. Staples is a great place to buy all of your supplies. Sounds like a great event! My girls really love the Teen Vogue line of products at Staples this year! We're actually done buying back to school supplies but since I'll soon be in the process of getting my work desk back in order, I really need to scope out their organizational aisle! I used to be Staples addicted. Back when I lived in the city and it wad down the road. LOL. That was my go to for the best office supplies and school supplies. This sounds like such a fun event. I love Staples. I buy my computers there. Sounds like a great event! I love school supplies lol that was my favorite part when I was in school! My son started school earlier this month, so I'm happy to say that most of my back-to-school shopping is done. I just need to buy some more essential clothing items (i.e. socks), and he will be set! How fun for students to do the designing. I really like Staples, and this is very cool. Omg now this must of been an awesome event to attend!!! We always buy all our school and office supplies at staples. They always have exactly what we are looking for! We did all our back to school shopping weeks ago. But I do need a few things for my home office and I love what Staples is doing so I'm happy to support! We just finished our Back to School shopping and Staples was definitely included in our Shopping Trips! We love Staples! Its great to hear how Staples is giving back. I also like how they are getting inpit from students. I wish I could of made it to BlogHer this year! I bet that was super fun to go to the Staples VIP suite and get all that swag!! I want some swag I am going to BlogHer next year for sure!